Specializing in cosmetic treatments and skin health, Roberta is an expert in general skin rejuvenation and maintenance. Born in Brazil, she earned her medical degree at the State University of Cascavel School of Medicine (UNIOESTE) in 2004, receiving her degree in Dermatology from the Souza Marques University in Sao Paulo in 2008. She has also specialization courses in Aesthetic Medicine and Anti-Aging Medicine from the Anhembi-Morumbi University in Sao Paulo. 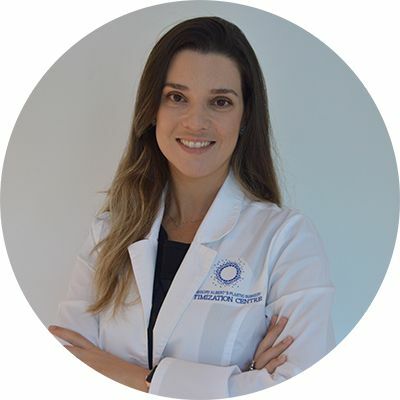 She is an active member of the Brazilian Association of Dermatology and Dermatologic Surgery, as well as other local and international associations. Roberta maintains a successful private practice in Florianopolis, Brazil. She uses the most advanced diagnostic and treatment technologies such as MMP™, a micro needling technique, to treat every patient with customized care for their health and well-being. It is her personal and caring manner that cultivates trust and confidence. She assists Dr. Albert with patient care management and help them achieve Optimal results. From the Outside In.